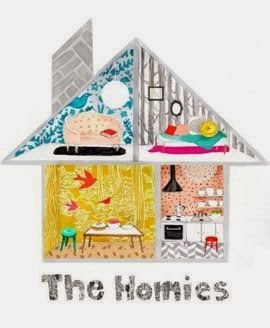 The Cow Spot has been nominated for a Homies Award for Best Home Projects & DIY Blogs, through apartment therapy AGAIN in 2014! You love me, you really love me!!!! We, me and The ol' Cow Spot, are SO grateful to be nominated and would REALLY appreciate your votes! If you already have an apartment therapy account - click here and sign in. If you don't have an apartment therapy account - click here to sign up. Once you have signed up, click on the "Home" Page at the top. Then look for "Homies Award" on the far left and click there. Once on the Homies Awards Screen you will see the category - Home Projects & DIY - click there. Voting ends this FRIDAY, FEBRUARY 21st at MIDNIGHT EST. The top 5 most nominated blogs in each category will become finalist. I would be beyond excited to be a finalist, so please spread the word and help The Cow Spot!!! Thank you in advance, as always I appreciate the love and support of my readers! Photo from apartment therapy website. Voted for the Cow Spot....and sharing the word so others can vote for you too! Thank you Cindy, I so appreciate your support!